Using data from underwater robots, scientists have discovered that beaked whales prefer to feed within parts of a Navy sonar test range off Southern California that have dense patches of deep-sea squid. A new study published in the Journal of Applied Ecology, shows that beaked whales need these prey hotspots to survive, and that similar patches do not exist in nearby "sonar-free" areas. For decades, the U.S. Navy has used high-powered sonar during anti-submarine training and testing exercises in various ocean habitats, including the San Nicolas Basin off Southern California. Beaked whales are particularly sensitive to these kinds of military sonars, which sometimes result in mass stranding events. 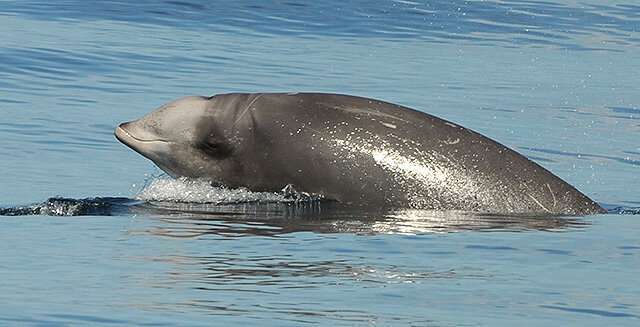 Following legal action from environmental activists related to these risks, the Navy modified some training activities, created "sonar-free" areas, and spent more than a decade and tens of millions of dollars trying to find ways to reduce the harm to beaked whales and other mammals. The researchers equipped an underwater robot with echosounders to measure the abundance, density, and sizes of deep-sea squids in different parts of the Navy test range, as well as in nearby waters. They also developed an "energy budget" for beaked whales, showcasing the costs—in time and calories—of hunting for squid. This helped the researchers estimate how many dives the whales needed to make in order to get enough food to survive in different areas. "Beaked whales work very hard to obtain their food. They are essentially living paycheck to paycheck," said Benoit-Bird. Unlike many baleen whales with significant energy reserves, beaked whales can't afford to expend too much energy on a dive that doesn't result in capturing many squid. In areas where the concentration of prey is low, the beaked whales must work harder and expend more calories—making reproduction and raising young that much more challenging. Some of the areas under study were so poor in terms of prey that whales likely could not meet their basic energetic requirements if they only fed there. "Despite how things might look from the surface, the deep sea is not uniform," Benoit-Bird added. "There are pockets of wealth where squid are abundant, and beaked whales know exactly how to find those hot spots." It turns out that a portion of the Navy test range off Southern California encompasses one of these hot spots—an area rich in squid. "Our findings, based on a novel integration of active sonar imaging and passive listening technologies, have multiple management implications," explained Southall. "They provide direct information to the Navy and federal regulators to better manage important and impacted habitat areas off California. And they give us new data on foraging ecology for population-level models of disturbance that have been at the heart of recent debate and litigation over spatial management and proposed sonar exclusion zones." This study is the first to link habitat quality with beaked whale behavior in such fine spatial scales. It also demonstrates that scientists can't assess the quality of deep-sea habitats by simply making measurements at the ocean surface, or even by measuring the physical and chemical properties of the deep ocean. Direct measurements of the prey environment at the depths where animals are feeding, coupled with observations of when and where animals are foraging, are critical. Maybe the sonar makes them feel good...especially if the sonar attracts the squid which taste good to them too. Whales love the navy. Even some of the old 'chiefs' look like them. On ship with one old sailor that strung a hammock from two posts conveniently on the fantasil that supportted some structure abovet the fantail so he could read his Russian newspapers in the shade.....think he was in 'intelligence'. He could read and sleep while fishing from five or six rods hung over the stern. Caught lots of Mahi-Mahi that way. He was fat as a whale and had to use 3./8" rope for his hammock in 9" mesh for his hammock. The cooks got the mahi mahi so we had lots of fresh fish for dinner. Fried in butter......yum. I would have been as fat as him if I stayed on that ship.